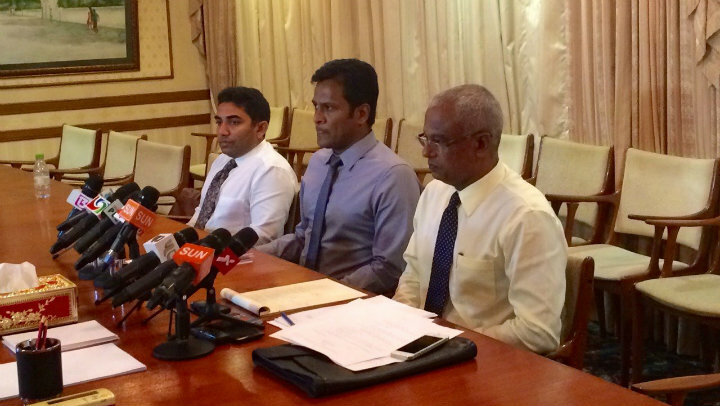 The opposition Maldivian Democratic Party (MDP) is against the government’s plans to reintroduce the tourism bed tax and hike the Tourism Goods and Services Tax (T-GST) from eight to 12 percent, parliamentary group leader Ibrahim Mohamed Solih has said. “We won’t agree to double taxation in tourism industry,” he was quoted as saying by newspaper Haveeru. Solih told local media that the MDP was also against raising import duties. A parliamentary group meeting will be held to decide the party’s stance on the government’s bills, he said. An extraordinary sitting of parliament has meanwhile been scheduled for tomorrow – during the ongoing two-month recess – to debate government-sponsored legislation to raise the T-GST and amend the Tourism Act. Amendments to the tourism law are intended to revive the discontinued flat US$8 bed tax and require resort lease extensions to be paid as a lump sum. Following the Majlis’s failure to extend the tourism bed tax before the end of last year, Finance Minister Abdulla Jihad told local media that the resulting losses to state revenue would be MVR100 million a month. Among other revenue raising measures proposed by the government include revising import duties, raising airport departure charge for foreign passengers from US$18 to US$25, leasing 12 islands for resort development, and introducing GST for telecommunication services. In December, parliament passed a record MVR17.5 billion (US$1.16 billion) budget for 2014, prompting President Abdulla Yameen to call on the legislature to approve the revenue raising measures, which the government contends are necessary to finance development projects. Speaker of Parliament Abdulla Shahid, Maldivian Democratic Party (MDP) MP Ibrahim Mohamed Solih and former President Maumoon Abdul Gayoom – Progressive Party of Maldives (PPM) – have met Jumhooree Party (JP) Leader Gasim Ibrahim, seeking the third-placed candidate’s endorsement ahead of Saturday’s presidential run-off. Speaking to press after meeting the MDP leaders at his residence in Male’ last night, Gasim said the party’s presidential candidate had also called asking for his support in the poll against PPM candidate Abdulla Yameen. “I said [to Nasheed] we have made our statement on behalf of our party. There have been no further developments to say anything at the moment against our statement, [which was] to not support any presidential candidate, under the present circumstances. Nonetheless, we are close friends, we are not enemies,” Gasim said. 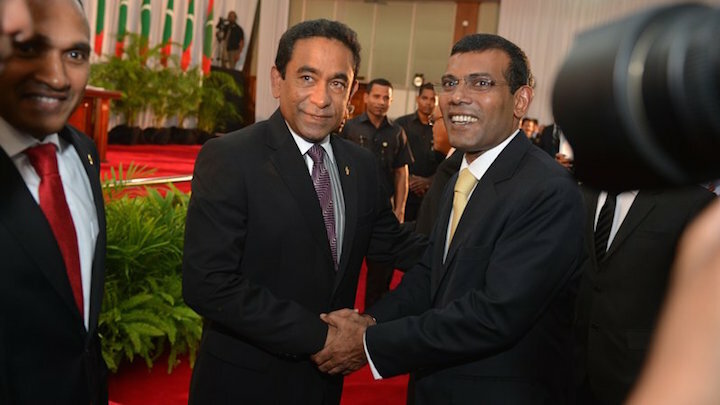 Nasheed emerged the frontrunner in the November 9 revote with 46.93 percent while Yameen polled 29.73 percent. The JP candidate finished third with 23.34 percent of the vote. As no candidate reached the required 50 percent plus one vote, a run-off election has been scheduled for November 16. While Gasim announced on Sunday night (November 10) that the JP council had decided not to back either candidate, he told reporters last night that “everything is subject to change”. “Not that I’m saying it will change. What they mentioned is a request of theirs. Each of us should believe that taking the right steps always after thinking about the nation is the best way. So what I have to say is that I can’t make a definite statement, even personally on my own, at the moment,” said Gasim. “But there are possibilities of saying later what I wish or think, isn’t there? So there is no enmity. There is close friendship. With everyone. There is no personal problem,” he said. The JP national council reportedly voted against a proposal to support the PPM candidate. PPM candidate Yameen had visited Gasim shortly before the provisional results were announced and claimed at a press conference that Gasim “has expressed his support for us.” The party told local media yesterday that it was still hoping to persuade Gasim to back its candidate in the run-off. Gasim received former President Gayoom at his residence this afternoon and told the press that he would ask the JP council to reconsider its decision not to support either candidate. Gayoom told reporters that respect for Gasim among the public would increase if he decided to endorse Yameen. “He has said that Islamic norms and principles will be followed in his government. That was something that people had been talking about repeatedly. He has cleared up something that we had also misconceived,” he said. Speaker Shahid – who joined the MDP in April – thanked Gasim for his remarks. “False allegations” regarding religion had been made against the MDP to create doubts among the public, Shahid said. “What we learned after today’s discussion is that we can work with Gasim again like we did before. Both sides have that assurance. There is no difference between our thinking and ideology to develop the country and Gasim’s,” he said. Gasim concurred with the Hinnavaru MP and noted that he had “praised President Nasheed’s economic policy,” which was “nearly identical” to the JP’s policy. “I would like to believe that I am more of a reformist than a politician,” he added. Gasim was a founder member of the MDP and served as the Speaker of the Special Majlis convened in June 2004 to revise the constitution. Following his brief imprisonment on August 13, 2004 in the wake of a crackdown on an unprecedented pro-democracy gathering, Gasim was appointed finance minister during the final years of President Gayoom’s 30-year reign. Gasim resigned from Gayoom’s cabinet in July 2008 saying he did not want to take the blame for failed budgets and ran for president on the JP ticket. After coming fourth in the first multi-party democratic election in October 2008, Gasim backed MDP candidate Nasheed against the incumbent. However, the MDP-led coalition quickly disintegrated and Gasim resigned as Nasheed’s home minister 21 days into the new administration. Speaking in a TVM programme on October 14 about pro-government parties fielding one candidate against Nasheed, Gasim said a survey of his supporters showed that 60 percent would not vote for Yameen even if he endorsed the PPM candidate. “Not all of the people in the Jumhooree Party are anti-MDP people. There are people who support President Nasheed or MDP among us,” Gasim had said. Yellow flags were put up outside the JP’s main headquarters in Male’ last night, with Gasim’s slogans painted over. 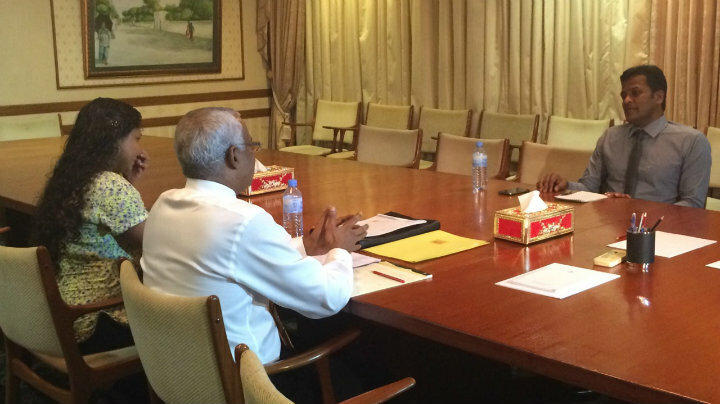 Parliament today approved a proposal by the Maldivian Democratic Party (MDP) parliamentary group leader Ibrahim Mohamed Solih for the speaker of parliament to assume the presidency in the absence of a president-elect by midnight on November 10. Solih’s proposal, seconded by MDP Chairperson and Hulhuhenveiru MP ‘Reeko’ Moosa Manik, was passed with 39 votes in favour and one abstention. 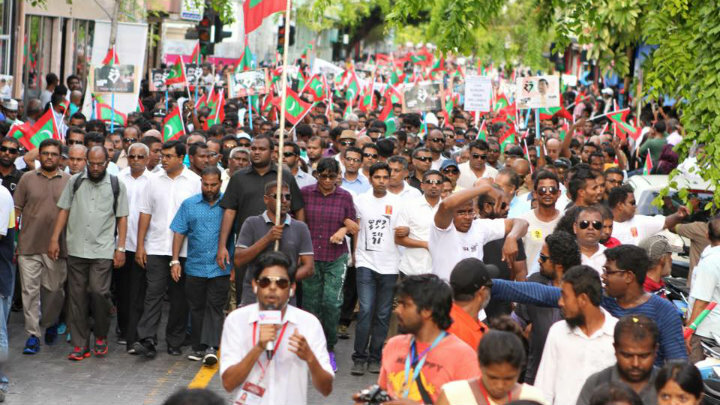 MPs of the Progressive Party of Maldives (PPM) and Jumhooree Party (JP) did not participate in the vote, claiming that the proposal was unconstitutional. The motion added that if the speaker cannot assume the office, the duties shall pass to the deputy speaker. If both are unable, a member of parliament elected by a resolution shall assume the presidency. Moreover, the motion stipulates that a presidential election and, if necessary, a second round run-off election should take place within 21 days of the speaker assuming the role of caretaker president. The new president-elect and vice president-elect must take the oath of office no more than 18 hours after the EC announces the official results of the election. A second motion proposed by MDP MP Ali Waheed to grant authority and discretion to the speaker to expedite decisions required by parliament “to prepare for the interim period” was passed with 37 votes in favour, two against and one abstention. Speaker Shahid joined the MDP in April. During today’s parliamentary debate, PPM MPs contended that the Speaker cannot assume the presidency without amending the constitution as there was no constitutional provision for the state of affairs in the absence of a president-elect after the expiry of the five-year presidential term. Dhivehi Qaumee Party MP Riyaz Rasheed said if parliament passed the MDP’s proposal, he would file a case at the Supreme Court to invalidate it. JP MP Ilham Ahmed meanwhile proposed that the military should take over if presidential elections are not concluded by November 11. As the constitution states that the security services are established “to enable all Maldivians to live in peace, security and freedom,” Ilham said he believed executive powers should be handed to the security services, consisting of the police and military. PPM MP Ahmed Shareef recommended referring the matter to the Supreme Court for legal advice, while MP Ali Arif declared the PPM’s support for President Waheed remaining in the post after November 11. Speaking at a rally on Friday night, PPM presidential candidate Abdulla Yameen reportedly said it would be “irresponsible” for President Waheed to resign before a new president was elected. MP Arif noted that the Supreme Court stated in its judgment annulling the September 7 election that the current president could remain in the absence of a president-elect. Independent MP for Kulhudhufushi Mohamed ‘Kutti’ Nasheed said that the current administration could not continue after November 11, suggesting that a constitutional amendment was necessary to specify a process to be followed in the absence of a president-elect. Nasheed cautioned that any motion or resolution passed by parliament in lieu of a constitutional amendment could be overruled by the Supreme Court. The independent MP abstained in both votes today.